If you plan your dinner party carefully, you’ll enjoy it much more. You want to enjoy as much time as you can sitting with your guests, and not spend the evening rushing to and from the kitchen. Decide on the main course, then plan a starter and dessert to complement it. Check your guests’ dietary requirements and dislikes. If your guests are vegetarian or vegan, you may find you can make a modified version of the main dish. Or you can serve food everyone will eat, such as non-egg pasta, or couscous. Alternatively, you could serve completely different main dishes. . Avoid dishes that need hands-on attention, like a stir-fry. Casseroles let you relax with your guests, not work over a stove. It is a good idea to have at least one course that can be served cold and can be prepared in advance. If you don’t have a dining room, you could convert the living room. Remove sofas and large chairs (or move them to the side) and disguise a utility table with an attractive cloth. 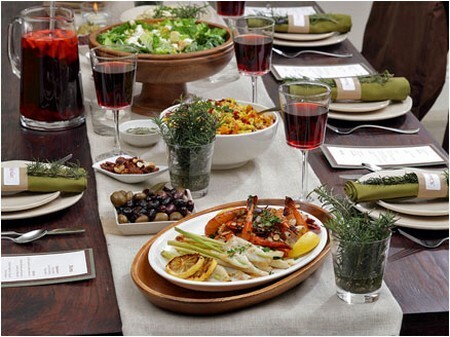 Make sure that you don’t cram too many guests around your table. A round table with a 90cm (3ft) diameter seats six people, a 135cm (4/:ft) table seats eight, and a 150cm (5ft) table seats ten. A rectangular table 180cm by 90cm (6ft by 3ft) seats six. As a general rule, each guest needs 75cm (30in) of elbow room. a You may find it easier to keep the main course and plates on a side table, in the room where you’ll eat. When you get to the appropriate stage in the meal, just carry in serving dishes so that you serve food to your guests at the table. Time the meal to be ready 30 minutes after the the guests arrive. Schedule your cooking to this, but remember that this will mean the main course needs to be ready around 50 minutes after the event starts (later still if you have a starter and soup). Don’t wait for late guests. It is far better for everyone else to enjoy a meal at its best, and let latecomers simply join in when they arrive. How to Compare Hotel Rates in Union Square?